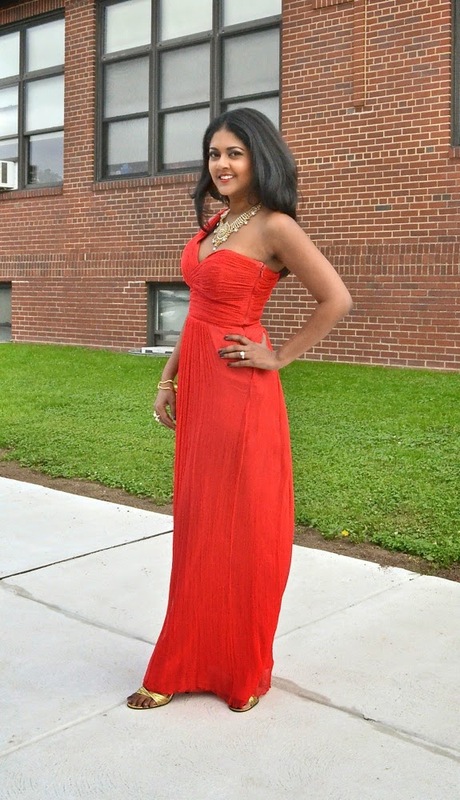 I’ve always wanted to wear a long red dress and I finally got my chance when I went to my husband's cousins wedding last week. It was a beautiful affair with tons of family and friends. It was great seeing all the family and celebrating the gorgeous couple. The entire room was filled with love and I am so happy that I got to be a part of this! This was my fourth wedding for the year, other than my own wedding, and the last one for 2014. I already have one lined up for next year and I’ll be surprised if it turns out to be the only one. My friends joke around with me that I am a bit of a wedding aficionado. I have probably been to over 40 weddings in my adult life. This actually helped me when it came time for my own wedding and allowed me to plan a 200 person New York wedding, mainly with guests who were from out of town, all on my own! No planner used here! I have a large family and my cousins range in age from late 40’s to just 6 years old, so the weddings aren’t even close to being over. But I enjoy them so much. I love weddings!!!! Other than the fact that it is an amazing celebration of two peoples love for one another that I am always honored to be a part of, it is also an opportunity to get dressed up, see friends and family that you don't get to see often, eat great food, open bar, and dance all night! They are the best parties! I don’t think I have ever replied with a “no” to a wedding invitation or ever will. I actually found this dress just four days before the wedding. I was fortunate enough to head over to the RTR sale and grabbed this on the first day! I was very lucky that it fit perfectly and didn't even need to be shortened, which is usually my issue with long dresses. I paired it with a simple gold strap heel but glammed it up with my indian jewelry that I usually wear with my saris. The contrast against this modern dress really made this outfit stand out more. I used my gold DIY clutch that had just enough room for my lipstick, which you can never leave home without!